Looks like the price is having difficulties to keep above the key support area. Can we stay above and continue to the key resistance? I personally think we can break through the key resistance before end of year. What do you think ? @tradewon waiting for best hope. Hope is bad okay, now what is another word you want to choose ? What price is that resistance? Good news are just 2 step forwatd. Wait just for 2 months. Yes. 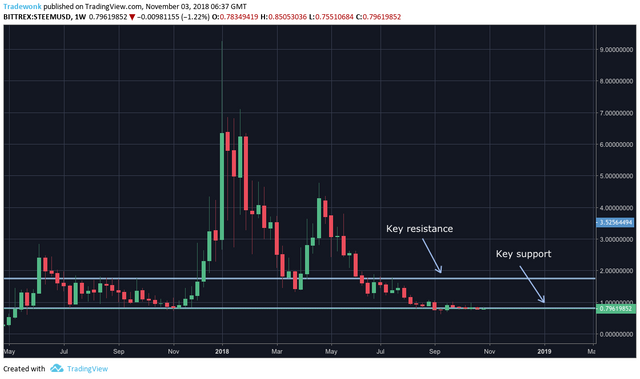 At the end of the year we can break through the key resistance. Hopefully steem price going up in last month of this year. Your rank has dropped 3 places in the last three days (old rank 1702). In our last Algorithmic Curation Round, consisting of 219 contributions, your post is ranked at #36.